Cast iron bollards are among the most versatile of all cast iron street furniture items, they can be cast in a huge variety of styles for a full range of uses. In addition to manufacturing engineering grade 250 cast iron bollards at our WB White Foundry site, ASF also offers ductile cast iron bollards manufactured by our other sister company, SG Castings. Many cast iron bollard patterns date back to Victorian times, these patterns often represent the mainstay of many urban schemes. Most of the UK's town and cities have their own cast iron bollard styles giving civic identity and reinforcing civic pride. From the classic and popular lines of the Cast Iron Manchester Bollards, to the robust look and feel of the Oxford Pattern Bollard, ASF have patterns for just about every traditional urban project. Architectural Street Furnishing's bespoke manufacturing capability allows the addition of coats of arms, lettering and logo's to further reinforce this civic identity, and add a particular style to traditional cast iron bollard patterns. Utilizing our on site pattern shop, ASF can manufacture completely new cast iron bollard styles, from conception and design through to manufacture and delivery. Meeting exacting customer needs and manufactured to an almost infinite array of styles, ASF's capabilities prove that the traditional material of cast iron can be cutting edge, modern and stylish. Being able to source high quality, UK manufactured, 100% recycled cast iron bollards direct from the foundry is becoming more and more a rarity. ASF have their own foundry offering a large variety of casting options. Airset and Greensand casting facilities as well as the option of casting bollards in aluminium for those jobs when a lighter weight cast bollard is needed. ASF can also cast bollards in gun metal and bronze for that extra special visual appeal. 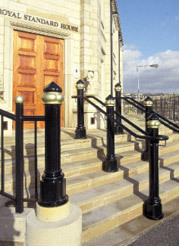 Architectural Street Furnishings can adapt or change cast iron bollards for a whole range of uses. They can be fitted with steel cores to make them stronger, or have chain eyes added so the bollards can be linked with chains. 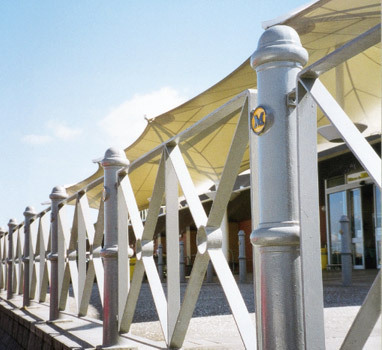 They can also have holes cast into them to accept many sizes of steel tubing so that a cast iron bollard can be converted into a post and rail system, a cycle stand or even take the role of the upright posts in pedestrian guardrail products. ASF's on site pattern making shop also means that the cast iron bollards can be altered to be placed on gradients or to make bespoke step units. All ASF cast iron bollards can be made to be removable, either keeping them as cast iron or casting them in aluminium to make them lighter. They can also be fitted into trough units so that the bollard itself can be folded down below ground level. For removable and fold down bollards it is often a good idea for ASF to make the cast iron bollard design from cast aluminium, thus reducing the overall weight by approximately two thirds. This helps with lifting and lowering the bollards and does not affect the style in any way. Certain styles of cast iron bollard are defined by their cap detail. 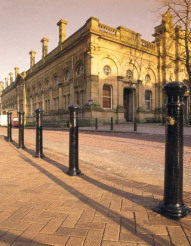 ASF have a range of patterns that allow some cast iron bollards caps and finials to be manufactured separately. This means that they can be used in conjunction with steel tube uprights to create features on otherwise simple post and rail systems. Combining steel and cast iron offers even more style and strength options to ASF's cast iron bollard ranges. Utilizing the durability, strength and relative flexibility of steel tubing for uprights, and dressing this with cast iron adornments, cast iron rings and cast iron caps that are available in a large range of styles opens new doors in street furniture design. ASF shot blast the completed bollard so that the different bare metals have a consistent surface finish before the final paint coats are applied. ASF can make extremely heavy duty bollards and then add heavy duty steel cores to these to make them even more durable. Increasing Ram Raid Resistance and casting large, imposing looking designs means that ASF cast iron bollards are still a market leader in pedestrian protection, building protection and crime prevention. Mild steel bollards are available in a wide range of shapes and sizes, and as with all ASF products can be adapted to a variety of needs. ASF recommend having steel bollards hot dip galvanised which gives them dynamic rust resistance to ensure they remain serviceable for a long time. Steel bollards can be made very strong if supplied with a loose cap, allowing them to be backfilled with concrete once installed. Steel bollards cross the gap between utility and aesthetic products very successfully with the addition of feature recesses, bollard cap detailing and a powder coated finishing - giving them wide appeal whilst maintaining their practical qualities. ASF steel bollards are manufactured in steel from recycled sources. Perhaps the epitome of modern street furniture style, stainless steel is understandably a very popular material for bollard manufacture. Strong, hardwearing and long lasting, a polished stainless steel bollard instantly adds a clean, modern feel to a project. ASF advise that all exterior bollards are manufactured in marine grade 316L stainless steel for maximum stain resistance, but are also aware that budget restraints often mean that grade 304 stainless steel is required - with this in mind all stainless steel products are available in either grade. ASF can adapt stainless steel bollards to a wide variety of uses, to form railings and fence posts, adapted for cycle parking, strengthened for ram raid protection and as mounting posts for things like signs and litterbins. ASF stainless steel bollards are manufactured in stainless steel from recycled sources. ASF can manufacture bollards in either fabricated or cast aluminium. Aluminium offers a lighter weight alternative to either iron or steel so is ideal for applications where bollards need to be removable, fold down or semi-permanent. In addition to this, for fabricated aluminium bollards ASF offer a hard anodised finish which gives a minimalist and clean finish that is only a few hardness points away from diamond. ASF aluminium bollards are manufactured in aluminium from recycled sources. There is a growing demand for granite to be used as a material for all kinds of street furniture. ASF have a range of bespoke manufactured granite bollards available in a wide variety of finishes. Hard wearing and impressively stoic - granite bollards combine the subtle, ergonomic feel of natural stone with an impressively robust look to create a visually impressive environment on all levels. Increasingly popular, recycled plastic is a practical and affordable material for bollard manufacture. Manufactured via a core free moulding process, ASF recycled plastic bollards are a good alternative to other materials when it is important to show an obvious environmental decision, or when a tight budget needs to be met. ASF recycled plastic bollards are environmentally impeccable and our source material, unlike some recycled plastics on the market, contain no fillers, chlorides or softeners. Pigment dyed throughout and available in a range of colours, they will not scratch or rot.